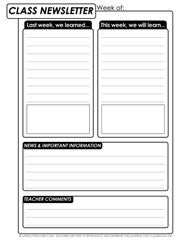 This classroom newsletter template can be used in any classroom, no matter what subject you teach– Reading, Language Arts, Math, Science, Social Studies, or even extra-curricular subjects such as Art or PE. It can also be used at all grade levels. This newsletter is a great way to incorporate writing across the curriculum, parent contact/involvement, and a review of what was learned in your classroom all in one place. This student-centered activity helps students put learning in their own words, similar to a learning response journal.